Berks Community Television has announced the next airing of its hit program Auction Action on BCTV – a unique show that brings live auctions right into the living rooms of viewers. It’s Thursday, March 29th, at 6 pm EDT. The host will be Bill Howze. Press Release (ePRNews.com) - Reading, Pa. - Mar 20, 2018 - Berks Community Television has announced the next airing of its hit program Auction Action on BCTV – a unique show that brings live auctions right into the living rooms of viewers. It’s Thursday, March 29th, at 6 pm Eastern time. As before, the show will be hosted by Bill Howze, owner of The Renaissance Auction Group and host of BCTV’s All That Stuff show. Items expected to get bidders excited will include baseballs signed by Ted Williams and Roberto Clemente, rare and valuable coins (to include a 1783 Nova Constelatio coin, produced in the US pre-Mint, plus a 1980 half-ounce .999 Krugerrand gold coin in its original South African Gold Coin Exchange holder), vintage hand-made quilts, Lionel trains, Kellogg’s Pep cereal comic character pinbacks, a 1920s Atwater Kent radio and an Edison Columbia cylinder Graphophone. At the beginning of the show, Mr. Howze will remind viewers how the auction works and preview featured lots. All bidding is online. As of March 15th, individuals were able to bid from anywhere in the world on their desktop or mobile devices. Berks County residents who have BCTV as part of their cable package will be able to view the show live and bid in real time. But the show can be live-streamed on BCTV.org. Viewers can bid live from anywhere in the world. The March 29th program will feature around 150 lots of items in a broad range of categories, to include antiques, collectibles, fine art, furniture, coins, paper ephemera and more. Some of the items are specific to the Berks County area, such as an early oil on canvas floral painting from 1915 by Mary B. Leisz, an English key-wind pocket watch in a sterling case from 1840 with a connection to Reading, and a papier-mache doll hand-made by Ludwig Greiner of Philadelphia. Artwork by Mary B. Leisz (b. 1876, death date unknown) was featured in the debut episode of Auction Action on BCTV, along with paintings by her mentor Christopher Shearer (1846-1926), Victor Shearer (1872-1951) and W. Eugene Burkhardt. All had direct ties to Reading and Berks County. The Leisz work in the March auction is considered important because she only did still lifes early in her career. It depicts red and white flowers with leaves and stems, in a period frame. The English key-wind pocket watch is from the 1840s and has a paper label inserted into the back cover that reads, “David Hollenbach, Chair & Watch Maker, Reading, America”. The Ludwig Greiner shoulder-head doll with hand-made clothing is descended through the Hartman family of Alsace Township in Berks County. The doll head is in excellent condition, with no paint loss. Also up for bid will be Berks County indentures (land deeds) from 1743 and 1776. The baseball signed by Roberto Clemente is also signed by many other Pittsburgh Pirate team members from 1959, the year prior to their miracle victory over the New York Yankees in the World Series. 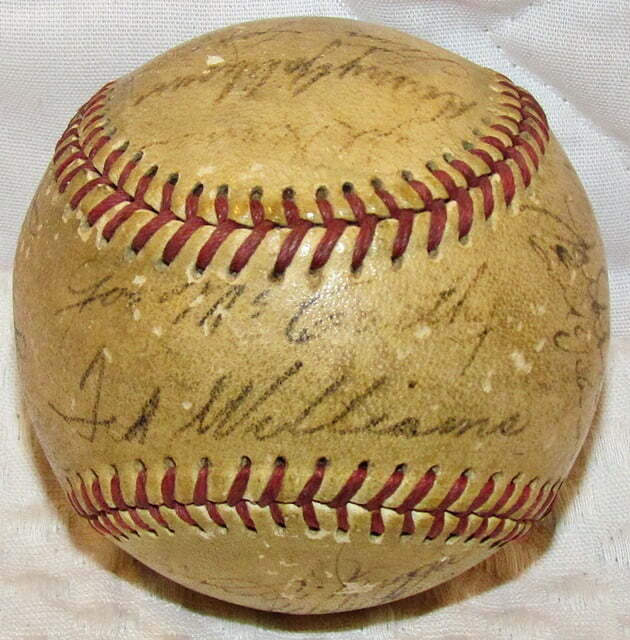 The ball with Ted Williams’s clear, bold signature (on the sweet spot, no less) also has the signatures of other Red Sox teammates from the late 1940s, plus manager Joe McCarthy. There are other sports-related lots in the auction. They include an autographed team photo of the Philadelphia Warriors basketball team from the 1948-’49 season, with all the signatures in black pen; a group of autographs from four former Major League pitchers: Hall of Famers Whitey Ford and Warren Spahn, plus Jim Bunning (author of a perfect game in 1964) and Tracy Stallard, who served up Roger Maris’s 61st home run; and a 1930s baseball catcher’s mask and chest protector. There are seven quilts in the auction. These include a sunbonnet baby hand-embroidered crib quilt, another hand-embroidered crib quilt, three handmade patchwork triple hexagon pattern quilts, a handmade patchwork circle pattern quilt and a handmade embroidered block quilt. They range in size from 27 inches by 40 inches to 74 inches by 83 inches. All are circa 1920s-1930s. The Lionel trains and related accessories comprise three lots. There are many items up for bid in a group, as one lot. Included are train cars, transformers, track and other items, mostly from the mid-20th century. All train items are from the same set used by the same family, once a year, at Christmas. As for the Pep cereal comic character pinbacks, there are 75 in all, all circa 1945. The characters include Superman, The Phantom, Flash Gordon, Popeye and Little Orphan Annie. The Atwater Kent model 20C receiver set and speaker is a big box radio from the mid-1920s, in “as-found” condition and housed in a cabinet in very good condition, with no cracks, chips or mars. The Columbia Graphophone dates to around 1900 and comes with four cylinder records. The figured oak case is in excellent condition and the reproducer and original crank are working. • A Chinese porcelain garden bench, circa 1820s, green ground with colorful decoration, embossed and enameled embellishments, center medallions with dragon/dragonfly motif. • A circa 1950s Asian four-panel coromandel room screen, with intaglio polychrome decoration on ebonized ground adorning both sides, each panel 72 inches by 64 inches. • A vintage 7500-watt industrial light bulb on a stand, manufactured by the Radiant Company, the bulb itself 11 inches by 8 inches and overall 18 inches by 9 ½ inches. • A 19th century half-length portrait of a young gentleman, found in an attic in Lewiston, Pa., painted circa 1840-1850. The subject has blue eyes and is wearing a black coat. All lots have a starting bid of $5 and will sell to the highest bidder, regardless of price. Auction Action on BCTV is scheduled to air from 6 pm to 10 pm, but because of the nature of an auction, the show may run shorter or even longer. The show will be telecast live from the BCTV studio. BCTV is seen in 100,000 homes in Berks County, through Comcast and Service Electric cable. Auction previews will be held at 1251 Chestnut Street in Reading (zip: 19602) Saturday and Sunday, March 24th and 25th, from 10 am until 1 pm Eastern time. Bidding will be driven through Bill Howze’s Renaissance Auction Group website, at www.auctionhowze.com. The show will be fast-paced – averaging one item sold per minute. Absentee bids will be accepted. To learn more about The Renaissance Auction Group, visit www.auctionhowze.com. To learn more about Berks County Television, visit www.BCTV.org.